And, of course, security challenges related to IT-network infrastructures. Hilco Industrial Auction: Plate & Angle Bending Roll; Press Brakes; Shears; Ironworker; Tube Notcher; Roll Former; Band Saws; Plasma Cutters; Welders; Forklifts; Carry Deck Cranes; Pickup Trucks & much more. Watch videos machines in action. Bid online or in person in Joplin, MO on June 7. We are looking for women in leadership positions or on the shop floor, those who represent dedication to their company and the industry, and demonstrate excellence in meeting their workplace responsibilities. And we need your help. 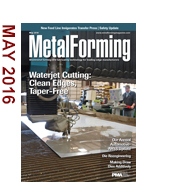 MetalForming magazine is seeking nominations for its new Women of Excellence in Metalforming section, to run in the November 2016 issue. The section will feature and honor those selected as a means to recognize and promote the importance of women in the metalforming and fabricating industries. Nominees should be employed by a manufacturer of metal parts and components or a supplier to the industry. The nomination deadline is June 30. Please nominate only one person from your company. Take a look at this robot-tended tube-bending machine, equipped with a simultaneous loading/unloading clamping mechanaism. It's a cleverly designed and engineered system that boasts a production capacity of 2000 180-deg. bends per day. Machines and hydraulic tools used in metal fabrication require exact working conditions to maintain optimal performance and product quality. With Parker’s SensoNODE Blue sensors and SCOUT Mobile software, users can diagnose and track issues related to pressure, temperature, and humidity in real-time, and address issues before they escalate. We’re looking forward to seeing you at the 2016 Die Design and Simulation Software Experience, taking place on June 1-2 in Grand Rapids, MI! This popular program, presented by MetalForming magazine, will feature interactive discussions, presentations from subject-matter experts and demonstrations from key companies on what’s new and trending in die-design, simulation and development software. You won’t want to miss this opportunity to learn about these new technology developments and how they can optimize your company’s manufacturing performance. Visit the event website to learn more. Transitioning its customer base from automotive to food manufacturing put this Nashville job-shop fabricator in the market for additional sheet- and plate-cutting capacity. With edge quality and cleanliness top of mind, a new waterjet machine with taper compensation fit the bill. This second in a series of articles examines the need to bench-test sensors to prevent surprises on the shop floor. Die Designer (IL) / Sko-Die, Inc.
CNC Programmer - Sheet Metal (OR) / Shimadzu USA Manufacturing Inc.